See how fabric designer, artist, and mama extraordinaire Samarra Khaja (SammyK on Spoonflower) created this dino map headboard for her son out of our new Faux Suede fabric* and learn how to make a DIY headboard of your own! SAMARRA: My eldest heads to 1st grade this fall. Call me all sentimental and whatnot, but I wanted to celebrate this first person to ever call me “Mama” by giving him something decorative that would also feed that cerebral sponge that is his thirsty brain. Fun and functional in one fell swoop. I decided upon a new headboard. It’s the perfect way to revamp the look and feel of a bedroom without sending one’s wallet off to weep quietly in the closet. 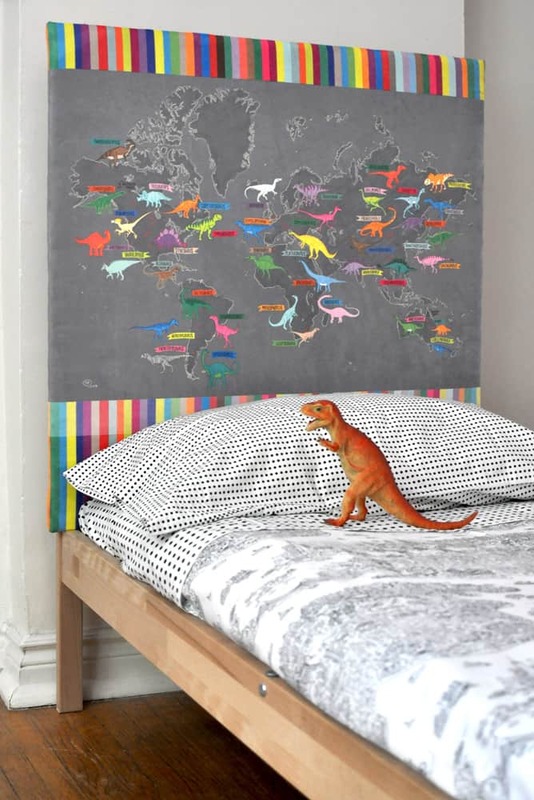 But this is not just any headboard, it’s a Dino Mapasaurus, my illustrated rendition of some of the places around the world that dinosaurs have been discovered (thus far <–wink, wink, lazy paleontologists of the world, let’s get crackin’!). My kids are pretty much dinosaur-obsessed, so this was the winning route to take.